Superhot long necklace with a pink plexiglass charm (tag). 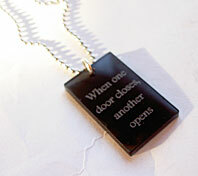 Text: When one door closes another opens. Size of tag is 40x25mm. Ballchain is stainless steel (allergy friendly). 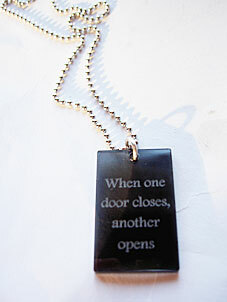 On the end of the chain you´ll find a manufacture tag of sterling silver.